Some of my earliest childhood memories of my father include him taking me and my older brother to the barbershop. I can remember the smell of the shop, the music, the laughter. I learned a lot going to the barbershop. How to shake a man's hand and look him in the eye. How to always tip your barber. One important lesson that I learned was that grooming is a ritual. Weather its weekly, or monthly, or whatever it is a ritual that changes the way we feel about ourselves. It is a rite of passage passed down from father to son. 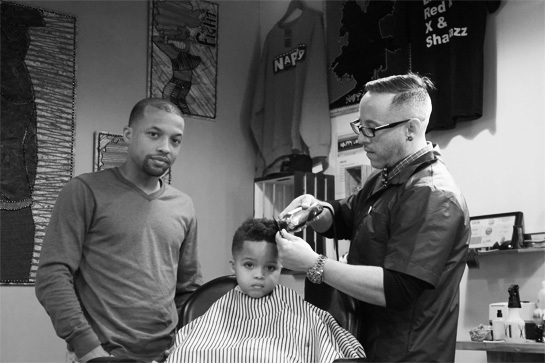 My grandfather took my father to the barbershop, and my father took me, and if I'm lucky one day I'll be able to take my son. But as a barber I've noticed a trend. The ritual is being broken. A new trend is forming. Fathers are disappearing from the shop. Mothers are replacing them. This is no knock against single mothers holding it down. It's just a sign that fatherhood is on the decline. There are less and less fathers teaching their sons to be men. As a barber this is a call to action to both the baby's daddy's and fathers out there. We need to step it up and if you see one of your brothers falling by the wayside don't just call him out, help him out. Also when you see a single mother with her son at the barbershop. Shake her son's hand, make sure he looks you in the eye, make sure he has a firm grip, and make sure he remembers to tip his barber!